Celebrating the publication of “Physical Medicine and Rehabilitation Board Review” Third Edition. For new doctors, selecting a residency program is one of the most important decisions they will make. We know our residency program is among the nation’s best in rehabilitation and we appreciate this recognition from Doximity. The rating comes from Doximity’s Residency Navigator, which provides information about residency programs to medical school students who will be applying to residency programs. More than 52,000 physicians have contributed nominations, ratings, and reviews. Residency Navigator combined their feedback with objective data on residency programs across 27 specialties. Residency Navigator also uses "alumni outcomes" analysis from analyzing the CVs and career paths of all U.S. physicians. The Physical Medicine and Rehabilitation (PM&R) Residency Program is based out of JFK Johnson Rehabilitation Institute and the residents of the program are residents of Rutgers Robert Wood Johnson Medical School and JFK Medical Center. 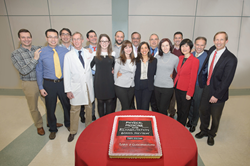 More than 150 residents and fellows have completed the program since it began more than 30 years ago. Each year approximately 400 to 500 medical students apply for four spots in the program. For more than the past decade, residents have had a 100 percent pass rate on their written board examinations. The residents also have had a 100 percent placement to fellowship programs. The residency has vibrant and engaged alumni, including many who now work as Medical Directors, Chairpersons and Residency and Fellowship Program Directors in rehabilitation programs across the nation. The residency program is fully accredited by the Accreditation Council for Graduate Medical Education. The Physical Medicine and Rehabilitation Board Review Textbook (Demos Publishing), widely used by doctors taking their boards in the specialty, was created at JFK Johnson Rehabilitation Institute and Dr. Cuccurullo is editor-in-chief. JFK Johnson Rehabilitation Institute offers 94 inpatient beds in a separately licensed hospital that is attached to the Anthony M. Yelencsics Community Hospital. Together, they comprise JFK Medical Center, a private, not-for-profit community hospital. The JFK Johnson Rehabilitation Institute is accredited by the Joint Commission. The facility is also accredited by the Committee on Accreditation of Rehabilitation Facilities. JFK Johnson Rehabilitation Institute is also licensed by the state of New Jersey as a Comprehensive Rehabilitation Hospital. For additional information about our inpatient services please call (732) 321-7733.